The Lubeck log cabin features a small log cabin with a super large canopy to the side. 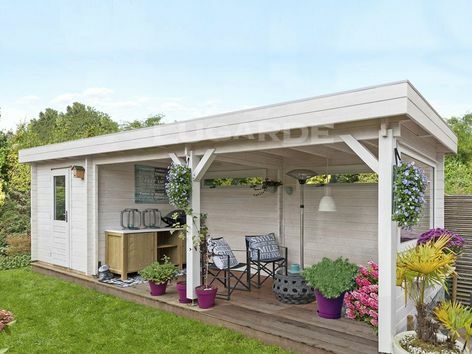 The canopy is nicely enclosed with a back and side wall but has 3 large windows allowing lots of natural light. The decorative posts and braces really set this cabin off. You can choose the optional larch decking floor. Overall measurements are 8m wide x 2m deep in 44mm log thickness. 1 x PE61H single door, 2 x PJ23 windows & 1 x PJ25 window included as standard. 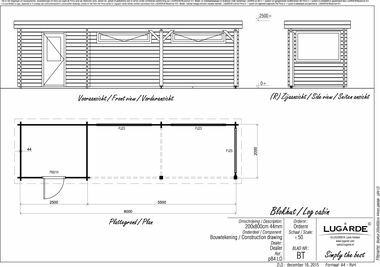 Cabin measures 2.5m wide x 2m deep and the veranda 5.5m x 2m.